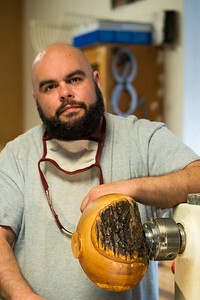 Foggy Moggy Creative Arts is the realization of two of Drew Harbaugh's passions: woodturning and photography. At first seeming to be disparate art forms, the two are more similar than a cursory glance would allow you to believe. While it is easy to learn how to operate the lathe and other machinery necessary to turn wood, the real skill and artistry lies in learning to use the mind's artistic eye to discern how much, and where, to shave the wood so that a beautiful piece emerges from the rough. Likewise, with photography, mastering the camera is one process, but learning to see through the eye of the camera and use it as a tool to express something deeper is more difficult. These are the pinnacles to which woodturner and photographer Drew strives. When he is not pursuing his art, Drew practices his career in intensive care nursing in a large teaching hospital, with an interest in palliative care and hospice as well as the medical needs of the LGBTQ population. He lives with his wife and four orange cats (who have their own social media following) in California's Central Valley.